Auto services retailer finds new ways to use LPQ program to boost profits. Mark Townshend, Vector Security, National Account Manager. to better understand the value of preventing losses as a tool to preserve profits in a financial environment where every dollar saved goes right to the bottom line." first in line to preserve profits at the individual store level. "Mark Townshend, Vector Security's National Account Manager assigned to Pep Boys, says that education is a formidable weapon against the constant threat of shrinkage and profit loss. 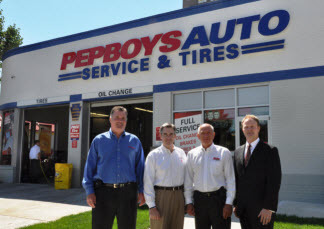 "Our arsenal of technologies to help Pep Boys combat theft and shrinkage, while improving profitability, now includes education, in addition to the more common loss prevention systems and services. It shows that Vector is always looking outside the box to identify ways to help our retailers improve their bottom line in addition to traditional and contemporary approaches. Vector's LPF scholarship program has been in existence since 2009 and awards deserving individuals with LP Qualified and LP Certified program scholarships each year.